The other night I watched Gnomeo and Juliet (which is actually a pretty cute movie), but I had a little bit of trouble because Pippi REALLY got excited about it. Here is what she did for the first 30 minutes of the movie. My favorite part is when she is fascinated by the water spout. So, if you get a chance, watch this movie if only to hear James McAvoy play Gnomeo. Just be careful if you’ve got a cat who likes tv. Looks really terrifying, doesn’t it? This is what I see every day when I wake up in the morning. This is what it really is. 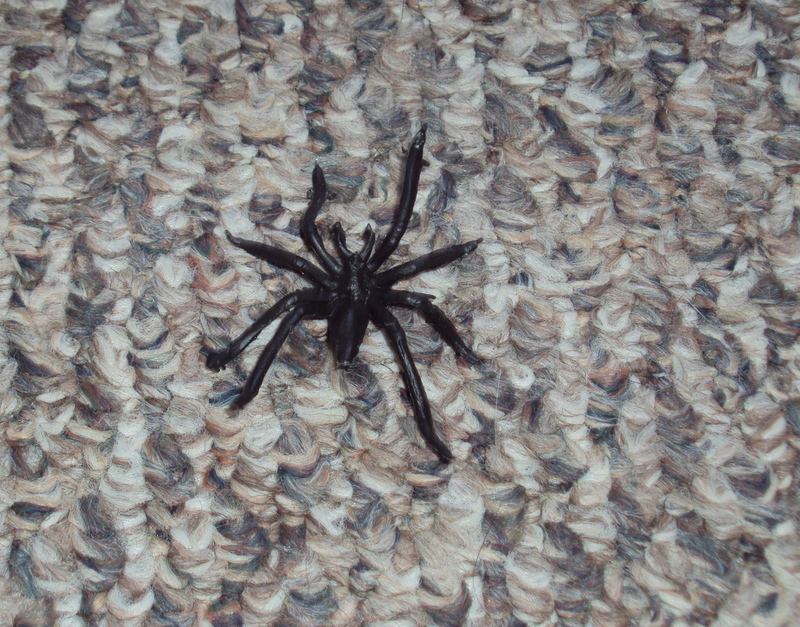 Just a little plastic spider that found its way home amidst all the Harry Potter stuff I brought back from the library display. 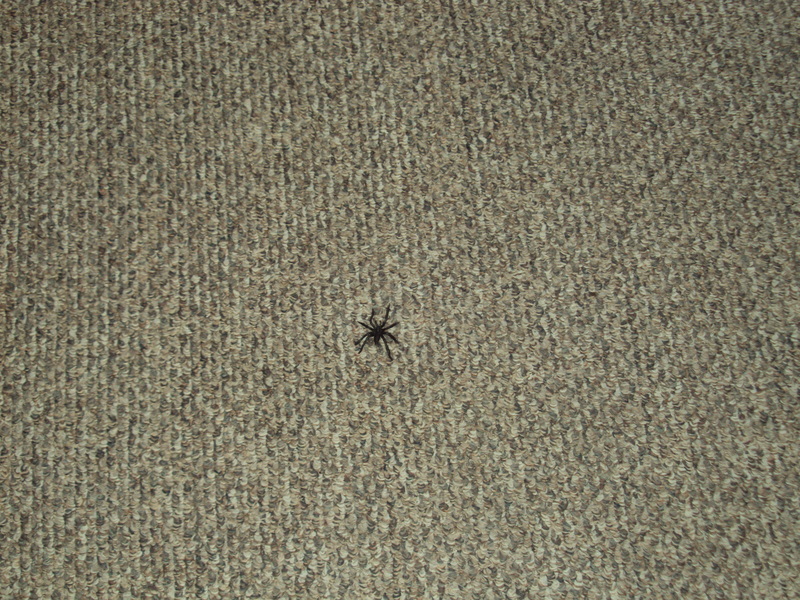 I know it is a fake spider, but every time I see it I freak out and scream like a little girl. It doesn’t help that I usually see it first thing in the morning when I am still groggy and not wearing my contacts. The reason why I always freak out is because it is never in the same place. It keeps moving all over my apartment when I’m not looking. I know who the culprit is. It is………………..Miss Hermione!!! 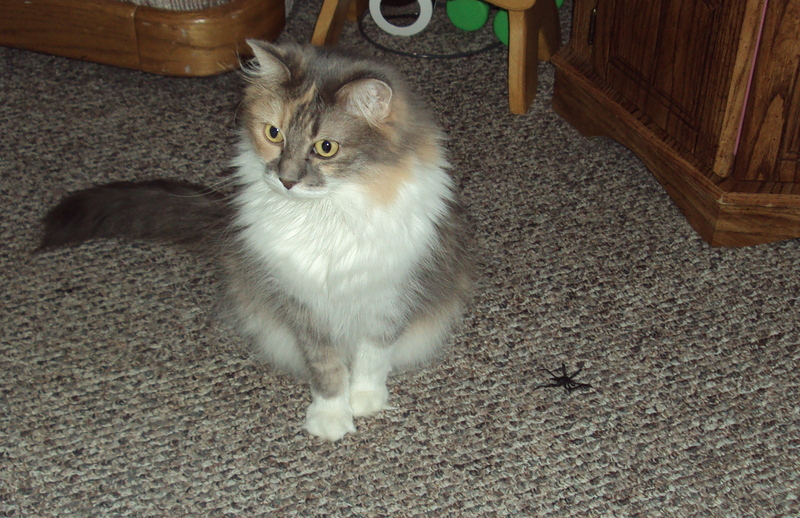 Here she is trying to look all innocent and pretend like she’s never seen the spider before. I don’t buy it for a second. P.S. Here is a video of me trying to get Hermione to play with the spider. She only seems to do it when I am not looking. I currently live in a very old building. And when I say old, I mean OLD. It is an awesome place that is really large and has a lot of “character” but there are some not-so-great things about it. One of the worst is that there are no doors separating the rooms (except the bathroom, thankfully). This has not really been a problem in the past, but now that I have four cats who HATE each other, it is sometimes necessary to separate them. It is two baby gates on top of each other, the top one being upside down (this is so the bar doesn’t hit me in the tummy all the time). It is the most hideous thing in the world, but it appears to be working so far. 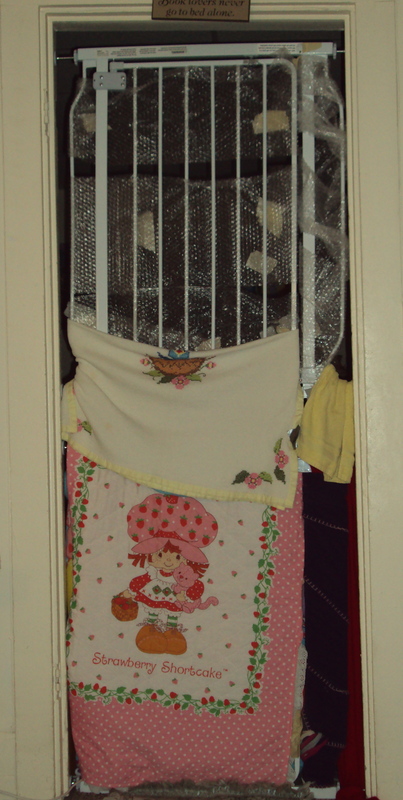 The reason for the blankets and bubble wrap is that Hermione got stuck in the bars after it was up for only 10 minutes. I worked really hard to make the bottom gate look nice (rock on, Miss Shortcake!!) but by the time I got to the top one I was feeling pretty lazy. So, now that you know the story, here is a video of what happened the other day when Addie and Hermione were in the bedroom being punished for attacking poor Pippi and Penelope. That was my first attempt at iMovie since library school, so I need a lot more practice, but I think it turned out okay-ish.